A tasty sugar cookie recipe that can be used for roll out cookies that don't spread. Using a stand mixer or hand mixer, cream butter and sugar together in a large bowl until combined and smoothed. Beat in egg and vanilla and mix until combined. In a separate mixing bowl combine sifted flour and baking powder by mixing. Gradually mix flour mixture to creamed butter mixture until completely combined. It is mixed completely when your dough mixture pulls away from sides of bowl. You may need to hand knead in the crumbly extras that didn't completely mix into dough ball. Roll out your dough 1/4" thickness between 2 sheets of parchment paper. 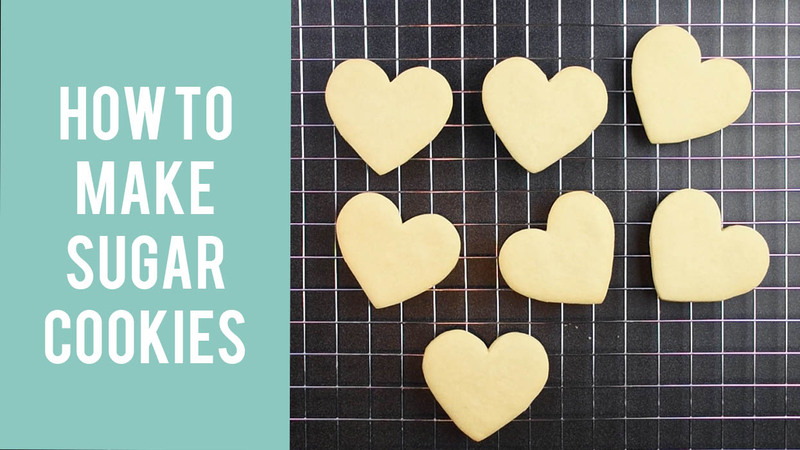 Use cookie cutters, fondant cutters or hand cut out your cookie shapes from dough mixture. Place cookie cutouts onto parchment lined baking sheet. Bake in 350°F pre-heated oven for 10-12 minutes or until cookies have set. Let cool for 5 minutes then transfer cookies to a cooling rack to cool completely. Cool completely before decorating. Watch below video on how to make sugar cookies.